Cambodia's government has signed a deal with Australia to accept some of its rejected asylum seekers in exchange for money. Australia's Immigration Minister Scott Morrison signed the deal on Friday with Cambodia's Interior Minister Sar Kheng. Australia will pay A$40m (£22m, $35m) to the South East Asian nation over four years, and resettlement costs. The deal has drawn stringent criticism from rights groups, who say Cambodia is ill-equipped to care for the refugees. The deal has sparked small protests in Sydney and Phnom Penh. Australia has in recent months introduced controversial policies aimed at ending the flow of asylum boats from Indonesia trying to reach its territories. Mr Morrison had earlier said the deal "enables us to fulfil on the policy which says no-one will be resettled in Australia". In a joint statement, the two countries said they had agreed on an "initial trial arrangement with a small group of refugees", followed by further resettlement according to Cambodia's capacity. Mr Morrison said only genuine refugees currently housed in a processing centre on the Pacific island of Nauru would be sent. Under the deal, only those who chose to go to Cambodia would be resettled. Transfers were likely to begin later this year and there was no cap on numbers, he said. Cambodia had said earlier it might take in between two and five people under the pilot phase, according to the Phnom Penh Post. Mr Morrison said in the statement that Australia would pay for initial support to the refugees. It would also pay for Cambodia to develop resources to integrate the new arrivals. Mr Morrison said the Cambodian government was "making countless efforts to develop the country" and was "demonstrating its ability and willingness to contribute positively to this humanitarian issue". He told the Australian Broadcasting Corporation the A$40m would go towards various "development aid projects", and was on top of the A$79m that Australia already gave in aid to Cambodia. Rights group say Cambodia is an impoverished nation with a record of corruption. They have pointed out that it has in the past sent back refugees to countries where they have been persecuted. Amnesty International has described the deal as a "new low in Australia's deplorable and inhumane treatment of asylum seekers". It accused officials of "putting the short-term political interests of the Australian government ahead of the protection of some of the world's most vulnerable people". Image caption Rights groups say that Cambodia is an impoverished nation ill-equipped to handle the refugees. About 100 Cambodians protested against the deal in front of the Australian embassy, reported the Associated Press. Activists in Australia also staged a demonstration outside the immigration department in Sydney. 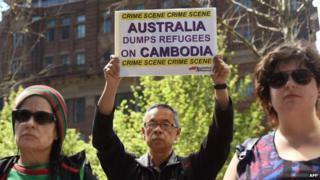 Australia-based Refugee Action Coalition's spokesman Ian Rintoul said: "Rather than give the Cambodia government A$40m to undermine human rights, that money could have been spent providing real aid and services that are needed in Cambodia and Australia." Should Australia's refugees be sent to Cambodia?